If you are not using the scorecards (Not Entering Hole by Hole Scores) the scorecard will not appear. Instead the Score Form will appear. The option to not use the scorecard can be found on the “Point Calculation Parameters” form, under the Setup menu. Select the option “Turn off scorecard”, to turn the card off. Note: Turning off the scorecard will limit the types of calculations that League Manager can do and the types of data that can be displayed in reports will be much reduced. It is highly recommended that you enter scores hole-by-hole. Select the desired player. Press the “+” key or right-click the mouse to view the player’s score form. Type the “Gross Score” and press ENTER. You are required at minimum to enter the Score and Points. 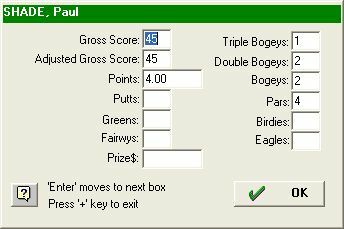 If this is the only information you wish to track press “+” to close the score form, otherwise enter the additional information—Putts, pars, birdies, and eagles.